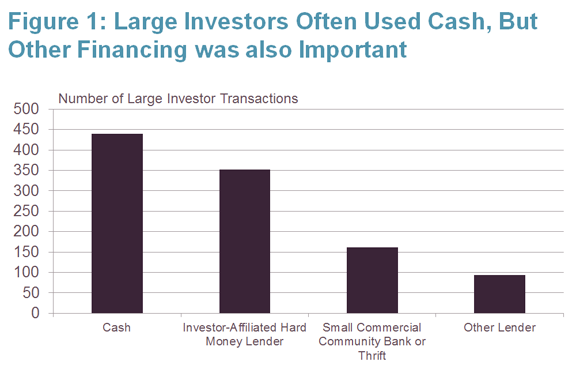 Investors accounted for a large share – 44 percent – of transactions between 2007 and 2012. Note: Percentages do not sum to 100 due to rounding. Source: Authors’ calculations of data from the Warren Group. While private investors operating on a national scale have received substantial media attention in the last year, in Suffolk County the largest investors had overwhelmingly local roots: 18 were based in Suffolk County and only two were headquartered out of state. Large investors were somewhat more likely to invest in highly distressed neighborhoods (35 percent of their foreclosure acquisitions, compared to 31 percent of the acquisitions of all foreclosure investors), and the majority of purchases were small multifamily buildings (2-4 units) or condos. Alan Mallach has defined a typology of investors in homes in distressed neighborhoods, with a key distinction being between those who seek to make their profit by quickly flipping properties to other buyers and those who seek to profit by holding onto properties for rental income. The study found that in Suffolk County a buy-and-hold strategy was most often pursued by large investors, supported by the healthy demand for rental housing in Boston. Although a few investors did turn over a majority of their purchases in a fairly short time, others who held onto most of their properties also sold a portion of their acquisitions when the right opportunity arose. 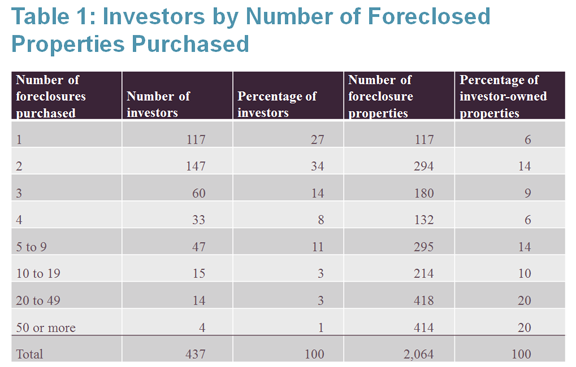 Overall, 66 percent of foreclosures purchased by large investors between 2007 and 2012 were still owned by these entities as of February 2013. 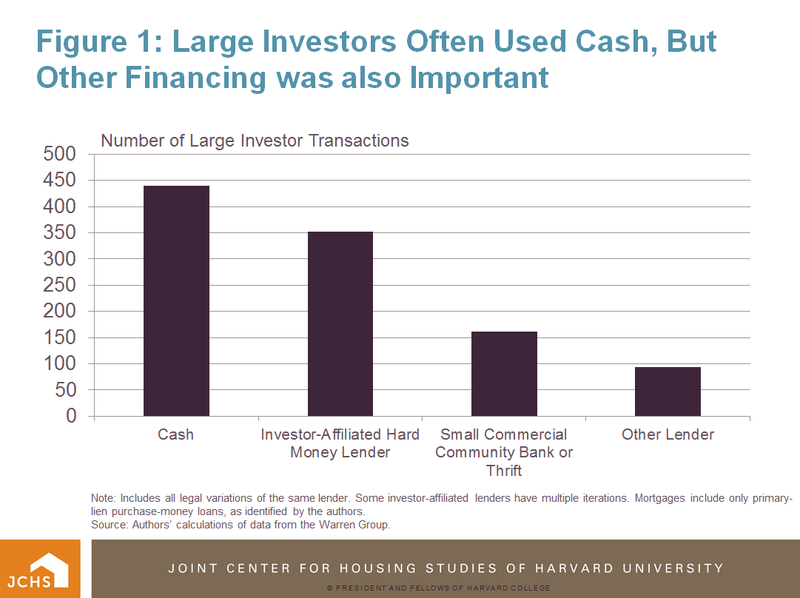 Cash was the most common form of financing, but hard-money loans from investor-affiliated lenders and mortgages from small community banks played an important role (Figure 1). Note: Includes all legal variations of the same lender. Some investor-affiliated lenders have multiple iterations. Mortgages include only primary-lien purchase-money loans, as identified by the authors. Given the significant presence of large investors in more distressed neighborhoods, this study primarily focused on the activities of these investors. However, based on anecdotal information, small investors face more challenges than large investors in distressed property acquisition, rehabilitation, and management due to more limited financial resources. The primary motivation for this study was to gain a better understanding of the extent and nature of investor activity in acquiring foreclosed properties in Suffolk County in order to determine the impact investors are having on the neighborhoods where foreclosures have been common. In the end, it can be difficult to predict the long-term impacts of investor activity. On the one hand, investors have channeled a significant amount of capital into distressed neighborhoods, which may have helped absorb the high volume of foreclosed properties and stabilized conditions in those communities. Our research team found that predatory flipping and irresponsible rental property management in Boston was rare. On the other hand, there is concern that investors who acquire foreclosed properties may not maintain them to the same degree as owner-occupants. In interviews, investors reported that due to factors such as the high market values of the primarily multifamily housing stock in Boston and the increased competition to attract tenants with Housing Choice Vouchers, they routinely undertook a fair amount of investment in properties they acquired. In fact, the median time to resale among properties resold by investors is about six months, which suggests that investors are likely to make some improvements to the properties before they are resold. However, in the view of many nonprofit advocates, these market-driven property improvements are not enough to ensure the long-term affordability and sustainability of these units. The discrepancy in these points of view reflects the motivation of many investors to undertake improvements up to the point that a decent return on these investments is likely, while community groups have broader goals of providing high-quality affordable housing and developing properties that have a positive impact on the surrounding community. Other advocates worry about investor decisions to increase rents that may displace low-income individuals and families who are no longer able to afford these units, and whether investors are crowding out potential owner-occupants looking to buy in these neighborhoods. Nonprofits partnering with city officials and investors have been working to alleviate these concerns. One nonprofit organization’s partnership with the City of Chelsea to track code violations in investor-owned properties has led to improved accountability and code compliance among investor owners. Other groups have recognized the value of leveraging investors’ support networks and informational advantages, with some partnering successfully with local investors on the acquisition and rehabilitation of foreclosed properties. One example is the Coalition to Occupy Homes in Foreclosure (COHIF), a group of nonprofits working with the City of Boston, the state of Massachusetts, and others that are looking to acquire 30 foreclosed or at-risk homes over two years. The Boston case study—along with other studies conducted by research teams in Atlanta, Cleveland, and Las Vegas—made an initial attempt to fill in the gaps of knowledge regarding investor activity in these central urban neighborhoods. 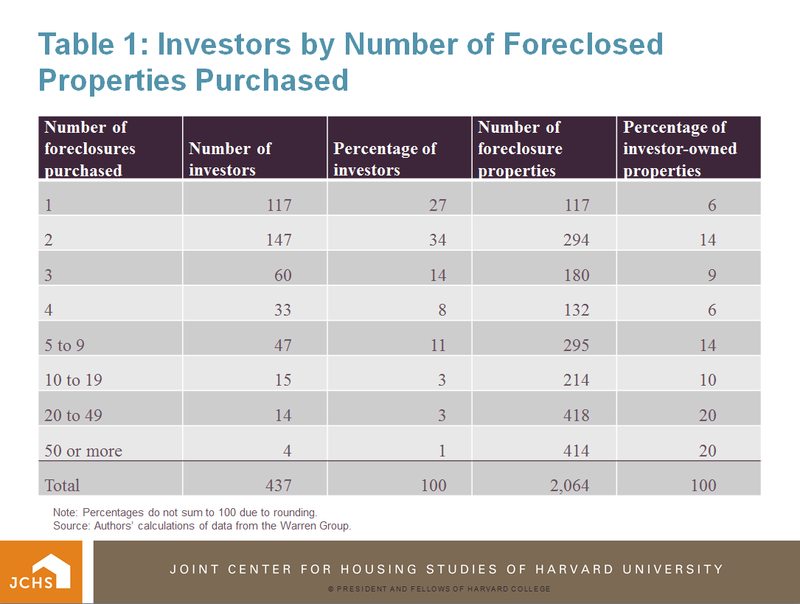 The vast majority of investors across the four case study areas operated on a rather small scale, with a sizeable share of foreclosed properties acquired by “mom and pop” investors who purchased one or two properties. For the most part, even “large” investors in these communities were defined as those buying 10 properties, over a 4 to 6 year period, with few purchasing more than 100 properties. While these studies have shed some light on the extent and nature of investor activity, there is a need for more systematic research that can address the concern of whether investors are worse stewards of foreclosed properties than owner-occupants, as well as better determine their long-term impact on the health and stability of distressed neighborhoods.